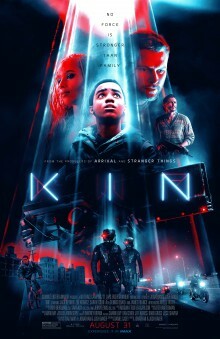 “Kin,” a pulse-pounding crime thriller with a sci-fi twist, is the story of an unexpected hero destined for greatness. Chased by a vengeful criminal (James Franco) and two otherworldly soldiers, a recently released ex-con (Jack Reynor) and his adopted teenage brother (Myles Truitt) are forced to go on the run with a weapon of mysterious origin as their only protection. Join LatinoScoop at an exclusive advance screening of KIN in select locations below. Click on the link below for your city and enter the code. If you download a screening pass and aren’t able to use it, please share it with someone who can attend. There are limited number of passes available for each location. Screening passes are available on a first-come, first-serve basis. Additional passes will not be added once they are all redeemed. Anyone downloading a screening pass is advised to arrive early to secure seating. The theater is intentionally overbooked by the studio to ensure a full house. Plan accordingly to arrive with enough time.